Thank you, Karenne. This is SO interesting. And really clearly presented too. Did you find any good spelling ones? Or is the world waiting for mine? ;-) (Hope the world is patient if so). Interesting. I think people need people--teachers--to learn English. An app might work to do repetitive grammar exercises (always good), but I doubt students would have the self-discipline to use it! True, Shelley. I see the function of apps as hopefully replacing some of the "drone" type tasks in the classroom, which can be done at home/at leisure leaving the classroom to be more communicative... at the moment, yes, discipline to use is no doubt an issue! Hi again, Johanna - I just remembered the British Council Johnny Grammar has also got a section on spelling. Nice graphs....Are "interesting" and "fun" two separate criteria for you? I'm looking forward to your top 7. btw The spaced repetition multi-media flashcards program ankidroid is easily top of my chart. Thanks, John - on first look Ankidroid looks like a good tool for students to use by themselves, will have a deeper look later on. Re fun/interesting - that was a very difficult one for me to decide upon, and in the end the key for me was really about engagement and how that can be broken down into "easy" and "serious" yet both or either provide enjoyable experiences - so the best, of course, is the apps that combine both fun and interesting content! great survey and look forward to best of post. Great post and I've been following this space closely too. We have some apps at EnglishCentral and are working towards a full recording of a video on mobile (because phones have such great mics). I'll work on sending you something to test drive. I agree - spelling apps are needed! Hi Abracadra, sounds really good, with the amazing speech recognition software that you have on the website, I bet you'll be able to put something fabulous together and drive the market forward in terms of delivering a motivating-to-use app. Will be very happy to test-drive, do contact me via email (on the sidebar or find me through twitter!). In the meantime, take a look at the video functionality of "Speaking Pal," that app has some quite impressive features along that vein. Thanks Mura, YES - a lot of the focus seems to be on iPhone Apps but the reality is that Apple is no longer the leading manufacturer of Smartphones but is instead Samsung, who use Android obviously. Although, I too have worked for a language learning app producer, as a consultant, I took great pains to present this information (and the next couple of posts) strictly in terms of pedagogical merit. Hey Karenne. This is a very informative post. Though I have a fun take on this, yet I don’t think that MALL is ever going to be used for learning a language seriously or going to be an effective tool. I have been thinking of the application of such applications for sometime now. MALL – the acronym becomes a noun , or two different nouns. The first Mall is the shopping mall and the second Mall is a kind of a promenade. Both are places for leisurely activity.MALL is going to be used more for leisurely activities while travelling or waiting . of competition in that space which can be productive in learning. So, am not sure if MALL is going to be really effective. I do look forward to your views. Hi Karenne. Thank you for choosing SpeakingPal in your list. Our team indeed worked very hard on the mobile design. Your blog was very informative and interesting. Keep up the good work! Like any of these apps or new technologies regarding language training, the original software versions start out bland and lacking. However, it always seems like subsequent versions always make the improvements to fill in the holes. I think you have to embrace technology even if it has shortcomings today. I wonder how they determine something like "inappropriate gaming mechanics." If it helps teach you correctly, does it matter how? Sorry for the delay in responding - I recently moved house and still(!!!) don't have the internet at home so responses and posts are sporadic. Anyway, that's a great question and I'm really glad you asked it. Inappropriate gaming mechanics refers to when a company, publisher or app provider add in elements that are commonly found in games, such timed answers (beat the clock), badges, points that instead of helping or motivating the learners, distract them for their goal or learning objective. Additionally, in some cases, getting students to become focused on achieving badges can set up a similar scenario of shallow processing of the content, and ultimately when the badges aren't won (or even if they are won to easily) it may wind up creating demotivation towards the material. Thank you for this article. I have my doubts about M learning. First, it is given by the nature of students using mobiles. They want to have fun everywhere and let’s be honest learning is not that much fun. Second, to learn you have to repeat. When you browse you want to find new things not to repeat the old ones. Third, M-learning is a good business for mobile providers. The picture looks very much like one constructed by them (really professional.) You cannot control the amount of data your mobile downloads and the providers profit. Great post and really interesting research. Looking forward to the next two posts on this. When are you going to get internet again? Hi, Karenne! Mobile learning is really the in thing. Because of its portability, learners can learn anywhere, anytime. Hopefully there will be more spelling apps. 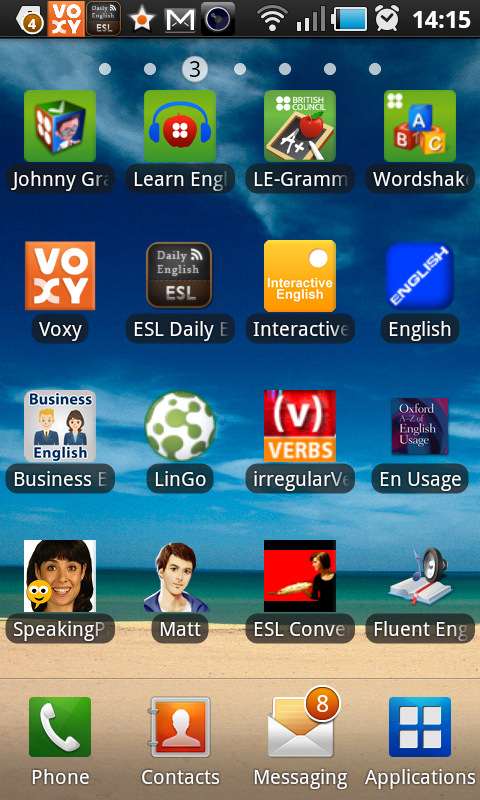 There are a lot of bad apps and we need more useful language learning apps.